Vancouver, British Columbia--(Newsfile Corp. - January 29, 2019) - Boreal Metals (TSXV: BMX) (FSE: 03E), a mineral exploration company with a portfolio of zinc, copper, silver, gold, nickel and cobalt projects in Scandinavia, has reported assay results from the first four holes of a recently completed diamond drill program at its 100% owned Gumsberg project, located in the prolific Bergslagen Mining District in southern Sweden. InvestmentPitch Media has produced a "video" which provides a brief overview of this news. If this link is not enabled, please visit www.InvestmentPitch.com and enter "Boreal" in the search box. The strategically situated Gumsberg project consists of six exploration licenses in the Bergslagen Mining District of southern Sweden totaling over 18,300 hectares, where multiple zones of VMS style mineralization occur. The project is road accessible year-round with nearby access to skilled labour, power and rail. The VMS mineralization at Gumsberg was mined from the 13th century through the early 1900s, with over 30 historic mines present on the property, most notably the Östra Silvberg Mine which was the largest silver mine in Sweden between 1250 and 1590. Despite its long-lived production history, relatively little modern exploration has taken place on the project. In December 2018 and January 2019, Boreal completed nine diamond drill holes, totalling 1,621 metres, in the vicinity of the past producing Östra Silvberg Mine. 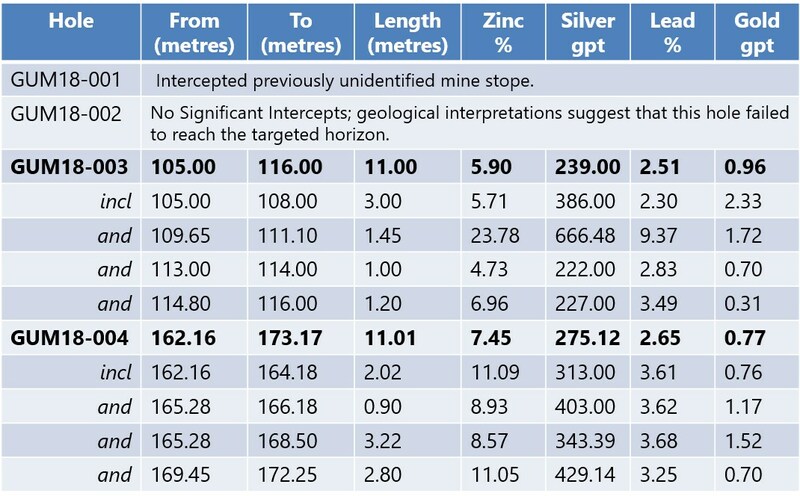 Diamond drilling tested prospective stratigraphy east and west of a previously reported intercept from BM-17-005, which returned 10.94 metres of 16.97% zinc, 656.7 grams per tonne silver, 8.52% lead and 0.76 grams per tonne gold south of the main Östra Silvberg mine workings. Together, this group of six drill intercepts constitutes an expanding zone of newly recognized mineralization that remains open to the east and at depth. Results from holes GUM-18-006 and GUM-18-008 are expected in the coming weeks. For more information, please visit the company's website at www.borealmetals.com contact Alexandra Woodyer Sherron, at 604-922-8810 or email alexandra@borealmetals.com.